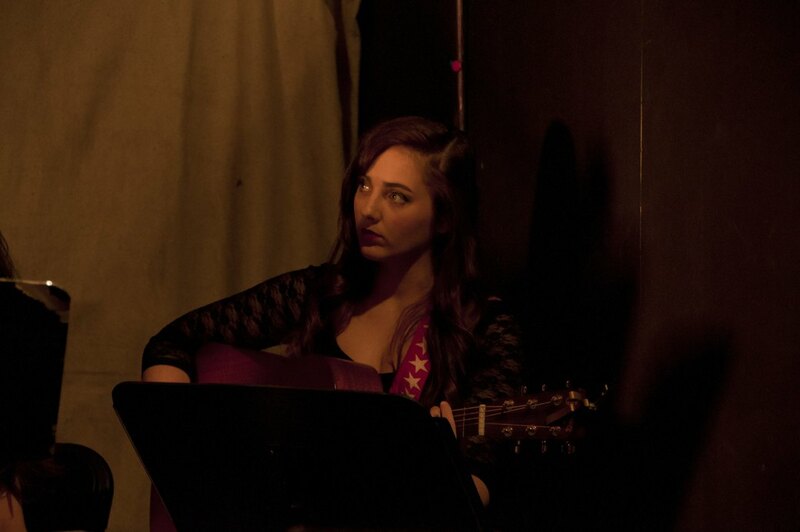 Last weekend, a slew of talented young performers convened in the back room of Catland, an occult bookstore in Bushwick, to flex their tragic Greek muscles. The show was put on by the new theater company Envelope Ensemble, which was founded by Charles Quittner, a student at Marymount Manhattan College who also put an ancient tragedy, Electra to a Bushwick backyard over the summer. He hopes to debut a full on stage performance of Bacchae, which was adapted from the original Euripides play by Austin Ruffer, sometime this year. But in the meantime, the wistful and energetic cast contented themselves with a raucous, ad-hoc musical behind an occult bookstore. 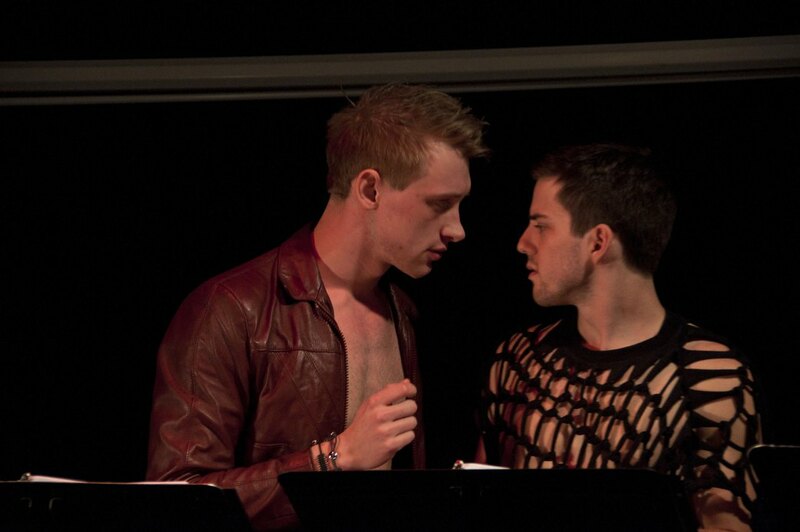 Pentheus, played by Ben Garrett, and Dionysus, played by Xalvador Tin-Bradbury. The performance, although casual, was fluid and precise. 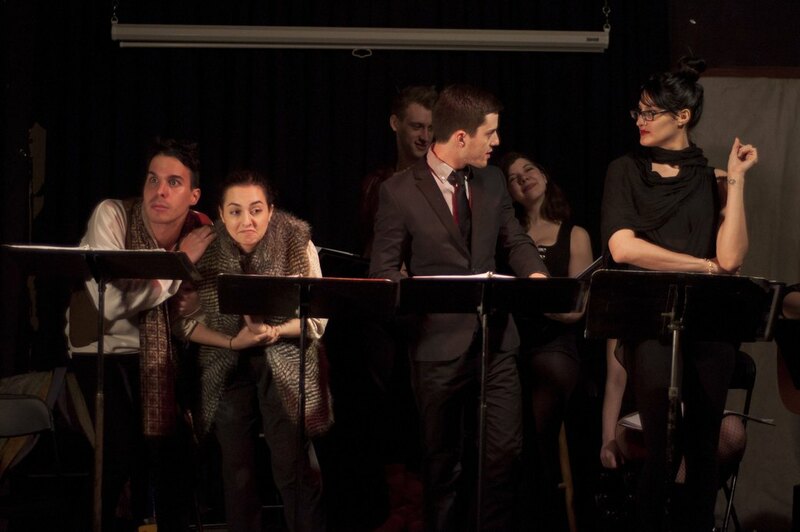 Actors read from scripts and stood behind musical stands. Costume changes took place just a few feet behind whoever was speaking at the time, and instruments (Stringed things! Tambourines! A soulful guitar player!) roamed the stage rather freely. Jenny Founds depicting the leader of the Bachants. Occasionally a quip did fall on deaf ears (a slightly illogical joke about debauched Mormons elicited mere titters), but the jammin’ songs, composed by Neil Douglas Reilly, are chock full of great lines (forgetting to tip is listed amongst Dionysus’ more egregious vices) and the outrageous chemistry between Pentheus and Dionysus kept everyone’s humors afloat. When they (spoiler alert!!!) finally kissed, it was almost as satisfying as Tom Hanks and Meg Ryan finally meeting each other at the end of You’ve Got Mail. Pentheus and Dionysus share one brief kiss before Pentheus succumbs to the call of the Bacchae. In fact, the banter between the two leading men was, without a doubt, the strongest dialogue in a play rampant with strong dialogue: quick witted and incisive, flush with heat. An exchange regarding Pentheus’ guardsmen, ending with Dionysus asking gleefully whether or not the ‘effective-looking’ guards could ‘serve him even better,’ positively glimmered with robust tension and delighted the audience. Tiresias and Cadmus, eyeing the Bacchae in the distance. Envelope Ensemble was birthed by Charles Quittner, and his energy is absolutely infectious. He envisions the Ensemble as being driven by a spirit of inclusiveness and open-mindedness, an acknowledgement of the exhausting compulsion to try on new things, and the drive to feel your way into the darkness of identity. 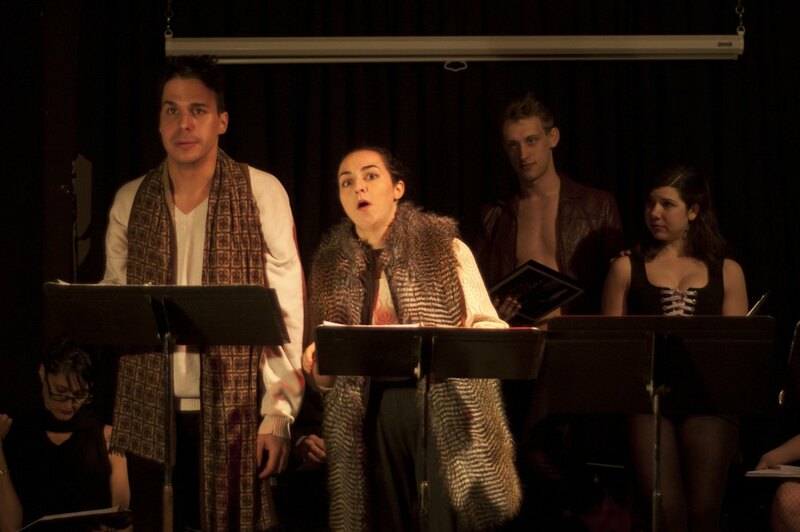 In this way, Bacchae (and Envelope Ensemble) emerges: a staged reading in a ragtag room, admission on a donation basis, the skeleton of full potential clearly visible through the fog. The entire evening reeked of the enthusiasm of youth, in the most pleasant, most viscous, most Bushwick way. 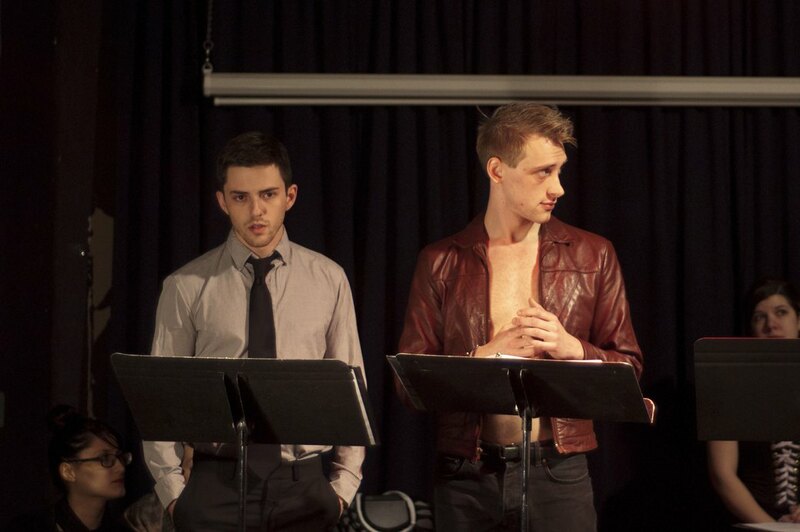 Bacchae was adapted from the original play by Euripides by Austin Ruffer and directed by Hunter Johnson. The music was composed by Neil Douglas Reilly.